California’s oak woodlands are home to more species of plants, birds, amphibians, insects and mammals than any other habitat in the state. Oaks are the key ingredient – they are hubs of life and provide food and shelter for thousands of critters. They are truly the defining characteristic of the landscape. Want to learn more about oaks? Well you’re in luck! This month, we’re releasing our first Minute with Matt, a new video series where I explore local wildlife, plants, farms and our work protecting open spaces. 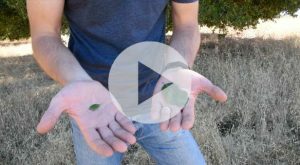 In this first video, I take you on a trip to POST-protected Pearson-Arastradero Preserve to show you how to identify coast live oaks, the most abundant species of oaks. Of the thousands of species that call oak woodlands home, the acorn woodpecker is one of the most iconic (and noisy!) They’re amazingly complex. Would you believe it if we told you that acorn woodpeckers get married, change their kid’s diapers, use day care and can predict the weather? It’s true! Dig into this blog to learn more.